Corporate Housing is defined as a furnished apartment, condominium or house made available for rent or lease on a temporary basis, primarily for 30 days or more. Corporate Housing, Inc. provides world-class temporary housing solutions for diverse corporate and individual clients along the Gulf Coast. We typically accommodate business travelers, extended-stay visitors, displaced homeowners, and vacationers, as well as visitors from several other industries. Turnkey service providing lodging, utilities, furniture, housewares, plus other amenities—internet, cable, & phone. 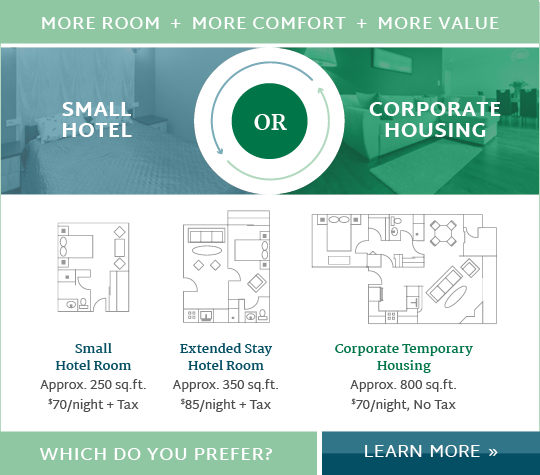 Corporate Housing, Inc. has the ability to individualize an apartment to specifically meet your needs. Our experienced leasing personnel can be trusted to help companies and individuals make informed and cost-effective choices. Corporate Housing, Inc. provides easy monthly billing for all provided services, including security deposits and utility connection fees. We also offer a highly professional & trustworthy house cleaning service. Where will you Need Housing? 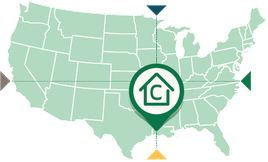 Corporate Housing, Inc. offers a variety of temporary living environments in many locations–big cities or small towns–within the contiguous United States. Contact an agent to learn further details about the city in which you're relocating. Need temporary housing in another state? No problem.